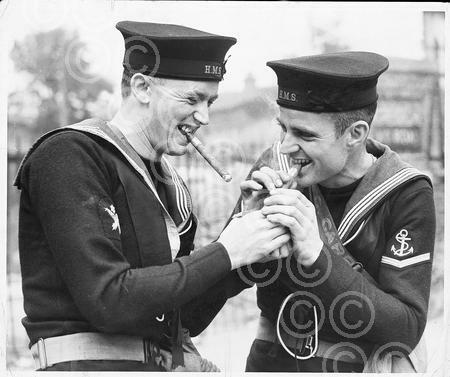 Oct 01, 1939 - London, England, United Kingdom - Sailors starting their leave in October 1939 with a long smoke, in this case emulating the First Lord of the Admiralty, Winston Churchill, who was known for his fondness for cigars. This image is the copyright of Daily Mail Mac Pugh. Its sale is restricted to private use and it may not be printed from the screen, copied, distributed, published or used for any commercial purpose without the written consent of Daily Mail Mac Pugh. This will redirect you to our Daily Mail Mac Pugh sales website to make your purchase.